Vancouver Fall and Winter 2016/17: How Bad Was It? Written by CMOS Bulletin SCMO on September 1, 2017 . Posted in Arctic, Weather, What's Current. 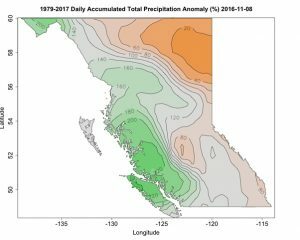 The fall and winter seasons of 2016/17 were noteworthy for the cold, wet weather they brought to regions of British Columbia (BC). Although all of BC experienced some impacts, the South Coast region saw particularly large impacts from an exceptionally wet fall that quickly transitioned into a persistently cold, snowy winter. This paper will provide an overview of the weather and impacts of the fall, then winter seasons. Figure 1. Fifteen-day accumulated precipitation anomaly centered on November 8th, 2017, relative to 1979-2017 period. Data from the ERA-Interim . October saw significant snow accumulations at mid to high elevations, and record rainfall amounts in many low-elevation areas across the South Coast. Temperatures warmed to record levels ahead of an atmospheric river event on November 8th, 2016. Many daily records were set, with new monthly records of 19.4°C in Vancouver and 22.4°C in Abbotsford (see Fig. 8 for all mentioned locations). The combination of record warmth and rain-on-snow led to large snowmelt contributions to runoff, in addition to the heavy rainfall itself. Figure 1 illustrates the fifteen-day precipitation anomalies for the first half of November. In several locations of the Coast it precipitated 200% more than normal. For the province’s primary electric utility, BC Hydro, the situation made for challenging reservoir operations, balancing dam safety requirements with minimizing downstream flooding. Although most reservoirs across the South Coast were full or near full, the most concerning was the Campbell River system. The upper part of the watershed received the normal November monthly precipitation in the first eight days of the month . Furthermore, one-week and two-week reservoir inflows set new records, and were estimated to exceed 1-in-100 year volumes. In emergency coordination calls and meetings, BC Hydro worked with nearby towns, regional districts, and the province, deciding to increase discharges to a record-tying 600 m3s-1, enough to fill an olympic-sized swimming pool every four seconds. This was done to mitigate the risk of overtopping the dam in subsequent storms, which would’ve meant passing the full reservoir inflows (1100 m3s-1), flooding communities downstream . At Vancouver International Airport (hereafter, Vancouver) there were only three days without rain in October and only two in November (Fig. 2). In fact, the fall and winter 2016/17 period had the second highest frequency of rain since 1937/38, with 121 days of rain during the 182-day (6-month) period (Fig. 2). Only the 1998/99 period was higher, with 131 days of rain. Furthermore, this 2016/17 period featured 22 consecutive days of rain (October 12th – November 2nd; Fig. 3). This was the longest stretch in the past five years, and the ninth longest since 1937/38. Figure 2 (on left). Cumulative number of rainy days at Vancouver International Airport. Time series for all years between 1937/38 and 2016/17 in grey, 1998/99 in red and 2016/17 in black. Figure 3 (on right). Consecutive rainy days at Vancouver International Airport for the past 5 years in grey, with fall/winter 2016/17 in black. In December the pattern abruptly became much cold and drier. Five arctic air outbreaks brought anomalous cold temperatures, and snow to British Columbia in December through February. Figure 4 shows the 15-day average minimum 2-m temperature anomaly across British Columbia centered on second arctic outbreak on December 11th, 2016. It shows the difference between what British Columbians would expect for that time of year and what actually happened. Temperatures were much colder than average, with much of BC more than 10°C below normal. In Vancouver, daily minimum temperatures were below freezing for most of December, January and the first part of February. This period was colder than winters in recent memory (5-year average, red line in Fig. 5) and the long term average (80-year average, blue line in Fig. 5). There were 54 days of below freezing daily minimum temperature during the entire 6-month period, more than any such period since 1992/93 (orange line in Fig. 5). The five arctic outbreaks can be identified in the smoothed minimum temperature time series by the large departures from the 80-year average, occurring on approximately December 5th and 11th, 2016, January 1st and 10th, 2017 and February 2nd, 2017; most followed by snow days (Fig. 5). Figure 4 (on left). Fifteen-day averaged minimum 2-m temperature anomaly centered on December 11th, 2016, relative to 1979-2017 period. Figure 5 (on right). Daily minimum 2-m temperature time series for Vancouver, smoothed using a 5-day rolling window for readability. Time series for all years in grey, 1937/38-2016/17 average in blue, 2012/13-2016/17 average in red, 1992/92 in orange and 2016/17 in black. Days with snowfall indicated with green dashed lines. These weather events directly impacted the general population as well as government and industry. Garbage was left uncollected for weeks in neighbourhoods of Vancouver, Burnaby, Surrey and Delta [3,4] due to persistent snow and ice cover in alleys and lanes. Across Metro Vancouver, many side streets and sidewalks were left uncleared and unsalted. Residents had difficulties simply getting around the city and questioned the Vancouver Mayor’s commitment to the issues . Nearby cities also experienced salt shortages, rationing their supplies. Stores and wholesalers were also having trouble meeting the demand . By the end of December, the city of Vancouver had spent $2.5 million on snow and ice reduction, triple the amount used in the previous two winter periods combined . Even after the unusual cold winter, Vancouver still needed to address the nearly 15,000 potholes (almost double than normal) affecting drivers . Long waits, cancellations and delays also left commuters questioning Vancouver’s public transportation system readiness for such cold winter weather  (Fig. 6a). 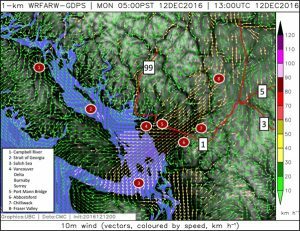 Additionally, strong arctic outflow winds over the Salish Sea during the outbreaks led B.C. Ferries to cancel sailings, impacting ferry commuters . Figure 6(a) Public transit buses paralyzed by road conditions during the December 11th, 2016 arctic outbreak . (b) A Google Maps screen capture, where orange and red colours indicate widespread very slow or stopped traffic during the February 3rd, 2017 arctic outbreak. During the arctic outbreaks, approximately $5 million was spent to operate an ice-clearing cable collar system on the Port Mann Bridge — the province’s primary east-west corridor for both commercial and commuter traffic. By contrast, just $300,000 was spent to operate it in 2015/16. Lane closure due to crews clearing the bridge and Highway 1 led to major traffic problems during the last arctic outbreak on February 3rd, 2017  (Fig. 6b). During the third arctic outbreak on January 3rd, 2017, BC Hydro set a new record for power consumption, breaking the old record set on Nov 29th, 2006 . Finally, in the last outbreak in early February, a storm cycle brought record-breaking snow and freezing rain to the Fraser Valley. Abbotsford observed 57.8 cm of snow  and there were reports of up to 80 cm in Chilliwack . Freezing rain accumulated 2-4 cm . 361,000 BC Hydro customers lost power  and Vancouver was cut off from the rest of BC with highways 1, 3, 5 and 99 all closed . The large-scale features providing the atmospheric context of these intense arctic outbreaks will be described next. Figure 7. (a) 50.0-kPa geopotential height (km) and 2-m temperature (°C), (b) sea level pressure (kPa) and 6-hr precipitation (mm) for December 4th, 2016 at 1200 UTC. (c) and (d), as in (a) and (b), but for December 6th, 2016 at 1200 UTC. 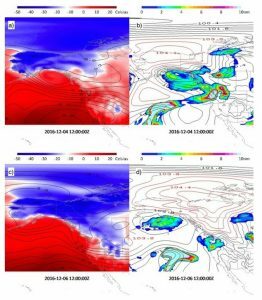 The five arctic outbreak events were each comprised of a cold continental airmass associated with a strong arctic high pressure system in Alaska and the Yukon, combined with a warmer, moist air mass associated with a Pacific low pressure system. The lows played an important role in producing periods of snow across the South Coast. In far northern latitudes, during winter the sun angle is low or below the horizon. This means incoming solar radiation is very limited, while outgoing radiation from the earth’s surface continues unabated. This creates a negative surface energy budget and the air cools, building very cold airmasses at the surface. Such airmasses are associated with strong high pressure like that seen over Alaska and the Yukon during the first outbreak between December 4th, 2016 and December 6th, 2016 (blue shading in Fig. 7a, and red sea level pressure contours in Fig. 7b). The cold, dense, stable airmass flows through valleys, fjords, and straits on its way to Vancouver, partially blocked by the higher mountainous terrain of British Columbia (Figs. 7c and d). Where the valleys, fjords and straits widen, the cold air spreads and thins, accelerating into arctic outflow winds . An example is shown in a fine-resolution computer model forecast for the second arctic outbreak on December 12th (Fig. 8). These outflow winds have impacts of their own, like the cancelled B.C. Ferries sailings in the Strait of Georgia mentioned in the previous section. Often an arctic outbreak event will draw to a close with the approach of a Pacific low pressure system ushering in moist, mild air. In the December 5th outbreak, an upper level low over the Gulf of Alaska moved southward down the coast (Figs. 7a and c). With low-level arctic air in place, the upper-level trough and associated surface low pressure brought 5-15 cm of snow across the South Coast, with 5.4 cm measured in Vancouver (Figs. 7c and d). While this is relatively little snow compared to snowfalls in other parts of Canada, it caused major disruptions. Figure 8. A fine-resolution computer model wind forecast for December 12th, 2017 at 1300 UTC. Vector orientation shows direction, colour shows speed. Terrain is grey-shaded. Geographic locations mentioned in text shown with red labels, highways labelled in white. Summary – Vancouver winter 2016/17, how bad was it? We’ve presented an overview of the weather and impacts of the fall/winter 2016/17 seasons at BC’s South Coast. The fall season was abnormally wet for multiple months, especially in terms of frequency of precipitation. This culminated in an early November storm cycle that caused headaches for emergency management personnel, and featured greater than 1-in-100-year cumulative flows for parts of Vancouver Island. Subsequently we discuss the anatomy of an arctic air outbreak, and showed that a series of five such outbreaks led to a well-below-normal winter, and an abnormally large number of days with below-freezing minimum temperatures. The result was a 6-month period of weather that, by the metrics discussed herein, was the worst in recent memory, and among the worst in history for the South Coast of BC. Fritz, W. Y. (Dec 20, 2016). Winter is no reason to mind your manners in @WinnieYeo [Twitter]. Retrieved from https://twitter.com/winnieyeo?lang=en. 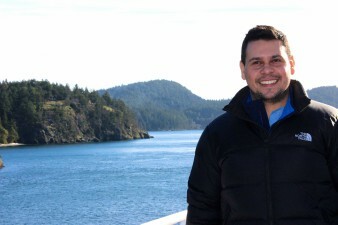 Pedro is a PhD Candidate in Atmospheric Sciences with the Department of Earth, Ocean and Atmospheric Sciences at UBC. He is developing a website for BC Hydro to forecast extreme weather events taking into account climate change. Previously, he was a school teacher in Mathematics in Brazil, Argentina and the United States.